Welcome to Nagato Flower Photo site. 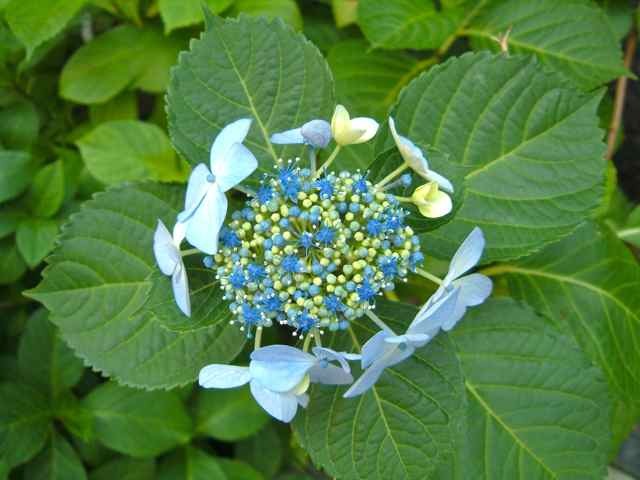 The flower of top page photo is Hydrangea, it is called Ajisai in Japan. It’s flowering season is at June which is rainy season in Japan. The photo was took at Araki-cho shinjuku-ku tokyo in 8th june 2003. It is the beginning photo for me that I started to take a photo. It was in 2003 when I started my new business, but the business was very slow and ｔhere was hardly work. As I had no job, when I was free, I took a walk well. One day, it was a day of festival of my town, we call “Matsuri”. I took a walk around my house with my camera, I took pictures which I watched things anyway. This photograph is one of them. When I watched this photograph on my Mac, I was impressed very much. All things what was troubled had disappered somewhere. I felt that I got courage from this photograph. From the day when I watched it, taking a photograph is my hobby. I have heard the same story. It is a reason why Mr.Tsurutarou, who is a famous actor in Japan, have begun to draw a picture. When he watched the flower of Camellia, called Tsubaki in Japan, he was impressed very much, too. He seemed to feel that a heart was inquired into. I thought that there is the person having a similar experience. I want to post the photos of Flower Which I saw around me as many as possible. As I am living in Japan, I want to take it mainly on a Japanese flower. There are many kinds of flower in Japan, because it is four seasons in Japan. It is a cherry tree in spring. Hydrangea(Ajisai) in summer. Cosmos in autumn. Camellia(Tsubaki) in winter. I am looking foward to taking how many flower photograph.